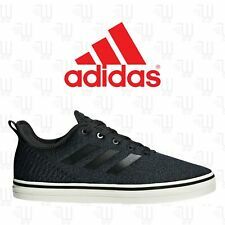 Adidas True Chill Shoes, Choose Size, BRAND NEW! Super cool and super comfy. Worn once. Great condition. Men's Size 7. Made Of A Mix Of Suede, Leather And Synthetics, These Shoes Feature Skate-ready Traction And Heel Support. Age: Adult. Color: Black. Product Details. Thanks for stopping by! We do accept offers on all of our items! Please check out some of our other items while you’re here! Up for auction today is a cool pair of Adidas sneakers. They’ve been tried on but not actually worn. Shoes are of a nice suede material. Shoes are perfect for skating in! Perfect for anyone that loves Adidas! Shoes will come packaged and shipped via USPS Priority Mail. No international shipping. Ships to a confirmed address only. Adidas Originals Palace Pro Chewy Black Green US 8 Brand new bought the wrong size and sitting in my basement for over a year. A little wear on box but shoes have never even been tried on. Condition is New with box. Shipped with USPS Priority Mail. Matchcourt Mid ADV. Rubber Toe Cap. Color: Brown. Age: Adult. Grippy Vulcanized Outsole For Precise Board Feel. Product Details. This is one of the sweetest coolest skate and casual shoe to sport on the streets! there is a major feature of this shoe the only way I can say it is that it has fat quality meaning it's a thick shoe which is awesome. adidas LUCAS PREMIERE Skate Shoes - Navy/White/Red - Mens Size 8.5. Condition is New with box. Shipped with USPS Priority Mail. Note, lightings and device settings can make small differences on the color tone of the pictures. GOOD preowned shoes. Honesty and Integrity is what our number 1 concern. Footbed /insoles have minimal footprints or foot dirt markings. These sneakers are just what your wardrobe needs! adidas offers many types of skateboarding shoes for men. These sneakers are made of durable materials that can help your feet stay protected and comfortable while you are skateboarding. What should you look for when buying a skateboarding shoe? Stitching: Skate sneakers should be stitched together and not glued. adidas skateboarding shoes are equipped with double or triple stitching to help the shoe stay together longer. 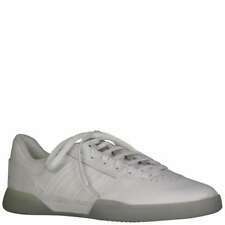 Material: adidas skateboarding shoes for men come in canvas, suede, and thick leather. Reinforcement: Shoes that are reinforced will have extra layers on the toe cap, the side, the heel, and on the lace eyelets to help them last longer. Weight: There has to be a balance between how much a shoe weighs and the type of material that is used to make the shoes. Grip: Your skateboarding shoes need to grip your board. This means the shoes can't have a sole made from regular street rubber. The shoes need to have gum rubber that can grip the skateboard. Padding: Your sneakers should have some padding for comfort. There are different layers of padding depending on the type of shoes you select. Protection for the laces: Skateboarding shoes that hold up will have lace holes that are reinforced with metal. Flaps over the lower laces are also desirable as they protect your laces when you do flip tricks. What types of adidas skateboarding shoes are available? The adidas brand offers a large selection of skate shoes to meet all of your needs. adidas Busenitz Pro: These shoes are crafted with premium leather materials and is available in both red and black. adidas Matchcourt X Bonethrower: These dark blue shoes are available in canvas or leather and have a grippy rubber sole for traction. adidas Busentiz Vulc Advanced: These olive-colored leather shoes have a durable upper and extra reinforcement. adidas Adiease Premiere Advanced: These brown with red stripes shoes have an abrasion-resistant suede upper and reinforced toe detail. What sizes do adidas skateboarding shoes come in? The brand's skateboarding sneakers for men come in a variety of sizes ranging from U.S. 5 through 14, including half sizes. Content provided for informational purposes only. 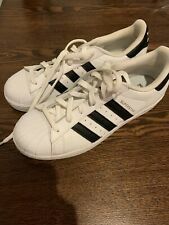 eBay is not affiliated with or endorsed by adidas.